Nezahualcoyōtl was born in about 1402 and died in 1472. In the years before Hernan Cortez invaded, Nezahualcoyōtl was born into the royal family of Texcoco. 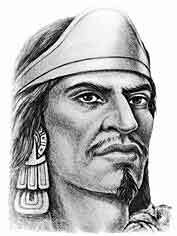 But when he was 15, he was whisked away to live in the capital of the Aztecs, Tenochtitlan (now Mexico City) as Texcoco was occupied by enemy troops. He convinced the Aztecs to become his ally and led an army to reclaim Texcoco, which he did in 1431. "... these laws ... deal with major crimes and their punishments such as treason against the king, adultery, robbery, superstition, misuse of inherited property, homicide, homosexuality, alcohol abuse and military misconduct. "... adulterers were flattened by a large and heavy stone or were stoned in the market; or if the adulterers had killed their spouses, then the male was burned to death and the female hanged. "... the thief was hanged...."
At the top of the judicial structure sat a supreme council of twelve judges and a two man court of appeal. Such became the legal reputation of Texcoco, that Aztec or other regional kings sent their difficult cases there for trial. The Aztec emperor at Tenochtitlan mostly copied Nezahualcoyōtl's code as his own. Image from the Banco de Mexico as featured on the 100 pesos Miexco currency.